You Do Realize We’re Leaving on Friday the 13th, Don’t You? 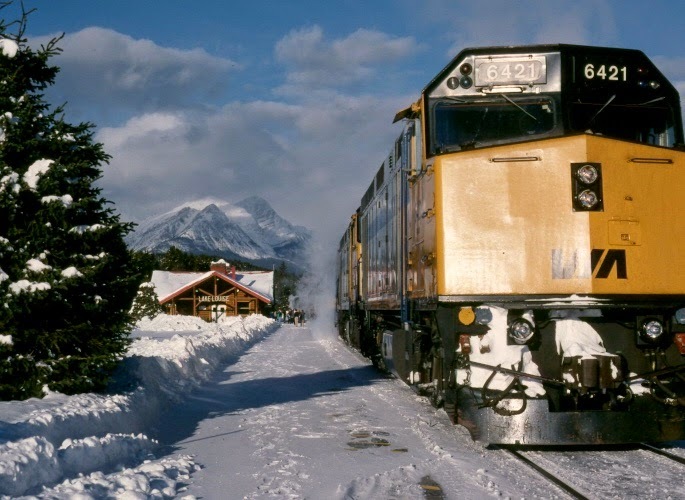 Twenty five years ago last month, the Canadian passenger rail system, Via Rail Canada switched the route that its flagship Vancouver to Toronto passenger train, The Canadian, used from the more southerly Canadian Pacific route via Banff and Calgary to the more northerly Canadian National route via Jasper and Edmonton. 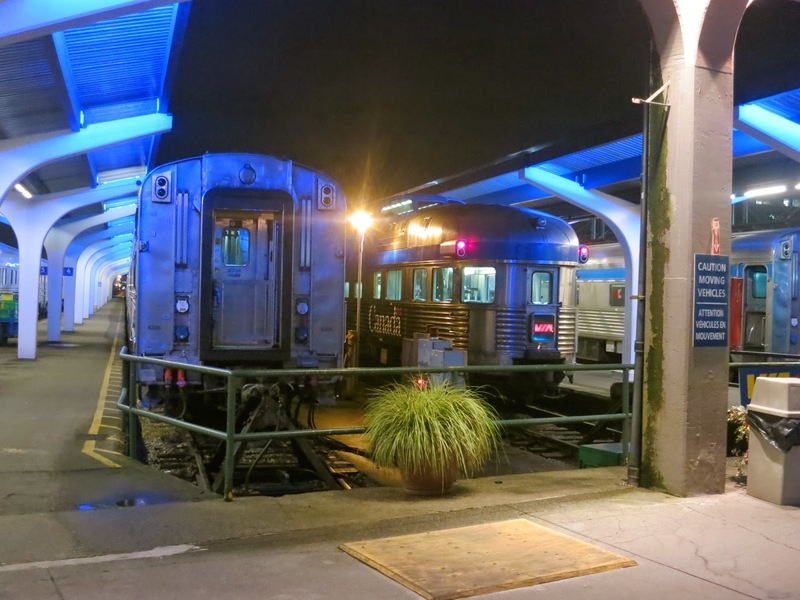 My friend Neil Lang and I resolved to ride on one of the last trains to use the old route. Neil lived (and lives) in Oakland, California, and of course I live in Pittsburgh so we met in Vancouver. 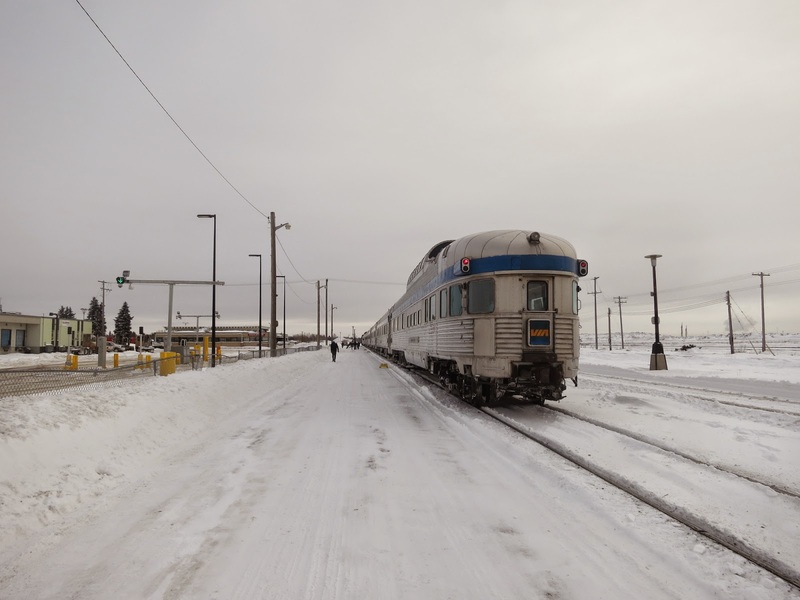 At the time The Canadian left in the late afternoon, arrived in Calgary mid-afternoon the next day, in Winnipeg the following morning, and in Toronto the next evening, so three days and three nights on the train. Because we wanted to sample a variety accommodations we had rather strange tickets. The first night we had lower berths in what is called a "section". If you've seen the wonderful movie Some Like it Hot you've seen a section. 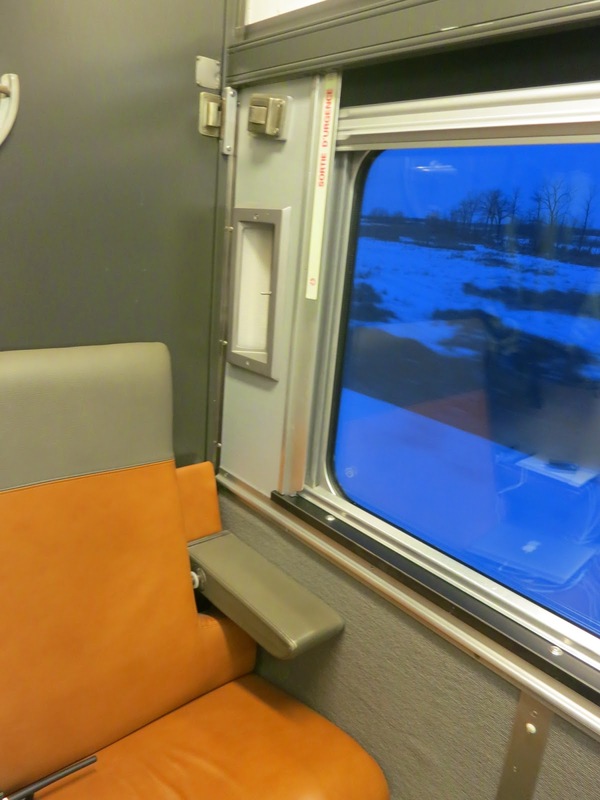 It is basically a curtained-in area with an upper and lower berth by night and a pair of facing seats by day. And, no, mine was not visited by Marilyn Monroe. The second night out we shared a compartment which is a private room with upper and lower berths and an annex with a toilet and sink. For the third night we shared the drawing room in the rear dome observation car (known as the "Park" car because all such Via cars are named after Canadian parks.) A drawing room is the largest room on the train and consists of two lower berths, and upper berth, and a toilet and sink annex. Travel across Canada in the winter is magical. There is snow everywhere the scenery through the mountains, and across the Canadian Shield is fantastic. The food was excellent, and the service was great and we were quite happy with our trip to Toronto. At Toronto we checked into a hotel near Pearson Airport as we both had flights home the next morning. The next morning we checked in for our respective flights. There was a direct turboprop to Pittsburgh on CP Air, but I decided to use frequent flier points and was flying American via Chicago. Neil was flying to San Francisco on United (also via Chicago) around the same time. It was foggy in Toronto and Chicago and both of us ended up sitting in the so-called “penalty box” on the tarmac at Toronto. We could see each other’s plane…for several hours while we waited. On my flight the Captain got on the PA system and apologized for the delay and said that if there was anything they could do to make us more comfortable that we should notify a flight attendant. Since it was noon already I told an attendant that I would be more comfortable if they fed us. She disappeared into the cockpit and about 45 minutes later a catering truck rolled up to our aircraft with small lunches! Finally, some of the passengers grumbled that they no longer had a reason to go to Chicago and wanted to get off the plane. After some discussion the plane went back to the gate around 2pm. There was a passenger agent waiting to help those who wanted to get off. In those days I always traveled with a pocket Official Airline Guide and noticed that there was a 3pm CP Air flight direct to Pittsburgh. As my grandfather always said to me “if you don’t ask, you don’t get” so even though I was on an award ticket I decided to ask the rep if there was anyway that they could put me on the direct flight on another airline. To my total astonishment they did and I got home well ahead of when I would have even if my original flights had been on time. Last summer Neil mentioned that it was coming up on 25 years since the above trip and wouldn’t it be nice to celebrate by riding the new route of The Canadian this winter. A friend of mine does this yearly in February and invites a group of friends along. This year they were to ride leaving Vancouver on February 6. My friend picks that date because of the full or nearly-full moon. It has become a major event and this year 106 people made the trip. Neil and I were not among them mainly because by the time we decided to make the trip there were no discounted rooms available. (Undiscounted rooms are over $1,300 for the one way trip.) Instead we booked the February 13th. After we picked the date Neil invited a Chicago-area friend, Greg Sommers, to join us. A friend of mine, John Bond, briefly considered joining us, but ran into the same $1,300 fare issue. 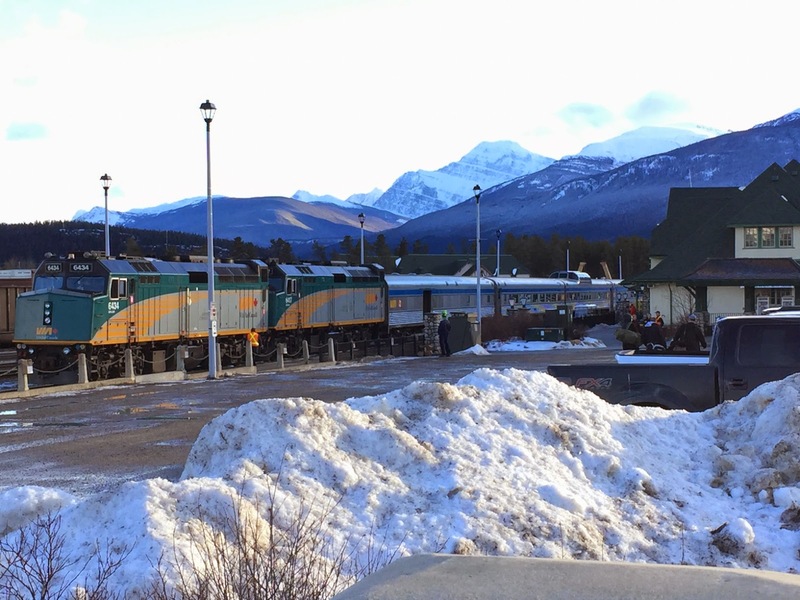 The Canadian now leaves Vancouver in the evening, arrives at Jasper, Alberta the next afternoon, at Winnipeg, Manitoba the following evening, and Toronto the second morning after that. It can range from being on time to being 12 or more hours late into Toronto depending on freight traffic along the way. Because current air travel makes it impossible to count on a same day connection (or perhaps it is because I am 25 years older and more risk averse) I flew to Vancouver from Pittsburgh on Thursday the 12th. Also because of risk averseness I looked for airports to connect through that would not likely have weather-related delays. The ideal route for my purposes would have been Pittsburgh to Toronto to Vancouver but I was afraid of the weather. 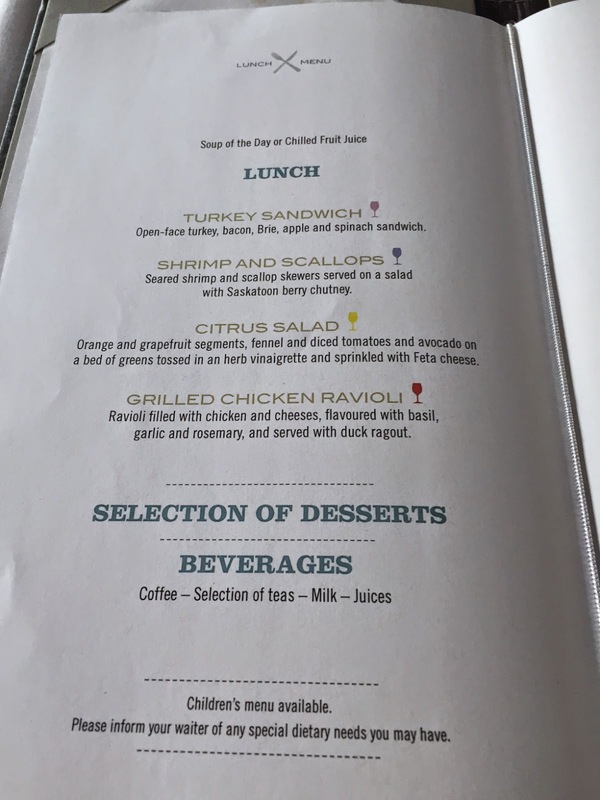 My decision was made easy when I found a one way first class itinerary for only 25,000 miles on American connecting in Los Angeles. On the day of departure there was a little snow on the ground with a promise of more to come later in the day. After dropping my car at an off-airport parking location I was through security (thanks to TSA PreCheck) before 7am for my 8am flight. The plane was brought in from the hanger and we boarded in time for an early departure and then the cockpit was stormed by three gentlemen in orange and yellow safety jackets who would not let the plane depart until they fixed a valve (or perhaps the indicator light attached to the valve.) They eventually released the plane and we left 95 minutes late. I wasn’t worried because I had a 3 hour connection. Once we got started the flight (on US Airways) was good. I found it unusual that there was no entertainment aboard but since I had planned to read a good book that didn’t matter to me. The first class meal service was quite good. Nothing plastic, nothing paper. The napkin even had the button hole in it. I thought this kind of service had disappeared years ago…but apparently it is back. We arrived at LAX an hour late. LA is an awful hub, at least for American. The USAirways flights now come into terminal 6 and the AA flights go out of terminal 4. I had time to kill so I thought I’d grab a quick lunch after I worked my way to terminal 4, but the taco stand was quoting a 20 minute wait and the whole food area was mobbed so I settled for a donut. Then I discovered that American Eagle uses a satellite terminal about a 10 minute shuttle ride from terminal 4. Since I had plenty of time, this wasn’t a problem but I’d hate to be making a short connection. Even worse, I’d hate to be arriving in this terminal as the lines to get on the shuttle bus back to the main terminal were extensive. My regional jet 3+ hour flight to Vancouver left 20 minutes late due to a late arrival of the aircraft. First class service was again quite nice with some little turkey and cheddar sandwiches and various chips, etc. We arrived in Vancouver 25 minutes late, and I was quickly through immigration and onto the Canada Line train from the airport to downtown Vancouver. I emerged from the station into a light drizzle and walked three blocks to my hotel and was soon in my Regency Club room at the Hyatt Regency. I was having dinner with Tanya and Jordan Devenport, Mike McManus, and Murray Logan, long-time friends from BARGE (poker). After a quick drink in the bar we walked to Zefferelli's, a very nice Italian restaurant. Jordan and Tanya had to drive about an hour and a half each way to join us. Mike lives an hour away. I think Murray lives somewhere nearer but I was really happy they all made the effort to join me. Given the time zones I was too tired to make a long night of it and found myself ready for bed at 10pm. I slept well and when I woke up in the morning I enjoyed a nice breakfast in the Regency Club before walking across town to Greg’s hotel. We had a day to kill before our 2030 departure. We purchased day passes on the Vancouver transit system and used it to ride to Pacific Central Station to store our bags for the day, then to ride Sea Bus to North Vancouver and some other Sky Train lines, stopping for lunch at the Steam Works Brewpub (near the Sea Bus station) and dinner at the Flying Pig in Gas Town. We also did a lot of walking in search of an IGA to stock up on snacks for the train – you know, in case we got snowbound in Saskatchewan. Neil led this search into Gas Town because he thought he saw one there the day before. After a lot of walking, some of it in a heavy rain, we catch a bus back to near my hotel where there is an IGA just down the street. Aside: in the morning I was carrying an umbrella borrowed from my hotel. Of course there was no rain. By the afternoon I had returned the umbrella at check out and of course it rained – a lot. After dinner we caught a taxi to Pacific Central Station where we retrieved our bags from storage and went to the (heated) outdoor patio behind the station to await boarding. While we were on the patio the engineer for our train came up to us and we chatted. Then the passenger service representative, a very nice woman named Janet Fletcher came up to us and chatted (and admitted that she was a bit of a “drooler” which is I guess Canadian for “foamer”.) She scanned our tickets and let us board before she got to the real ticket line. And so I settled into my “cabin for one” (roomette) #3 in car 221 “Drummond Manor”. After dropping my luggage took some pictures of the train (in the rain) and to note the other cars in the consist. We had three locomotives, a baggage car, a coach, a Skyline dome car, a dining car, five sleepers (all identical “Manor” cars), and a “Park” observation dome car. 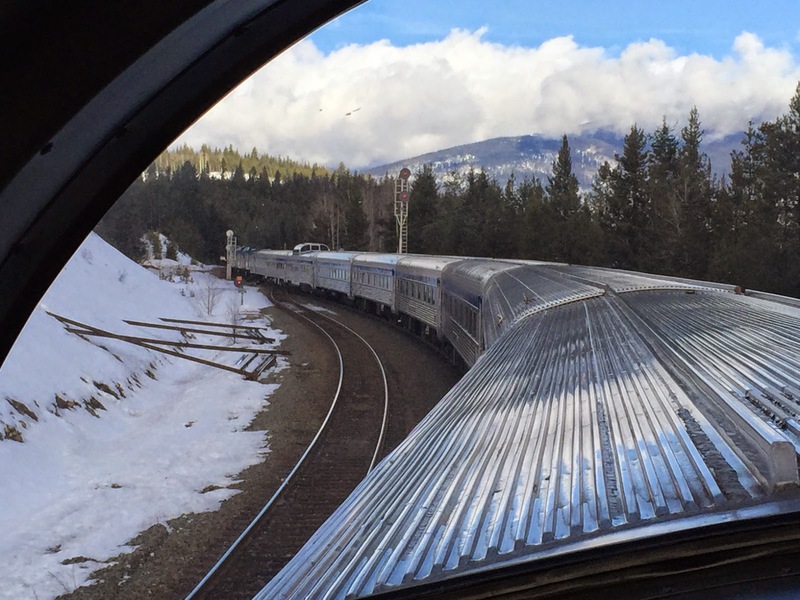 Neil, Greg, and I adjourned to the dome of the observation car and watched as the train left Vancouver right on the advertised. No mechanical delays, no late arrival of equipment, no weather delays. We just left. Shortly after departure the car attendant (Lucco, though I am sure I am not spelling that right) brought everyone champagne and hor dourves. I had a great beer (Fort Garry Dark Ale out of Winnipeg) and just enjoyed the train going through the towns and countryside before going to bed. My roomette bed was quite cozy and comfortable and I slept almost through the night. I awoke briefly when we were in Kamloops North and got out of bed a while after we left there. We all met in the dome before going off to our first meal in the diner. The food and service in the diner was uniformly excellent. Unlike Amtrak, Via seems to take real pride in the food they serve. I ordered a breakfast of bacon and eggs and toast and it came with actual toast…not the heated up raisin bread that Amtrak calls toast. Tables in the diner seat four people and we were three. That first morning we were joined by the singer that Via had entertaining the passengers enroute. Emily was a 19 year old professional singer from Toronto and she gave performances in each of the two domes on the train. After breakfast we went back to the dome and watched the beautiful snowy scenery unfold (and the many, many freight trains pass us) as we made our way to Jasper, Alberta. Jasper is the site of Jasper National Park and is in the heart of the Canadian Rockies. We had lunch (with Emily again) before our early arrival into Jasper at 1515. The train was not due out of Jasper until 1730, and the temperature was a balmy 39F so we had some time to explore the city. We reboarded at 1715 and the train left right on time, only to stop about two minutes later and back up a bit. We sat for almost an hour, blocked by a freight on the switches leading out of town. Dinner that night was with a fellow rail enthusiast, Matt, from Toronto. I had a delicious Rack of Lamb that was cooked just right. We had all but made up the hour before Edmonton, but were caught just outside of town by a number of freights and ended up arriving somewhat late. Instead of jumping off to perhaps get a picture of the train I went to sleep and again slept through the night…with only one slight worry. Rumor had it that the Canadian Pacific engineers were about to call a strike (not a problem for us because we were on the Canadian National). But a more troubling rumor was that there had been a derailment in northern Ontario, right on our route. By the time I woke up on Sunday morning, both rumors had been confirmed. The derailment was of disastrous proportions as it involved tank cars, a bad fire, and an all-but-inaccessible location. Throughout the day we speculated as to what this would mean for our train and us. 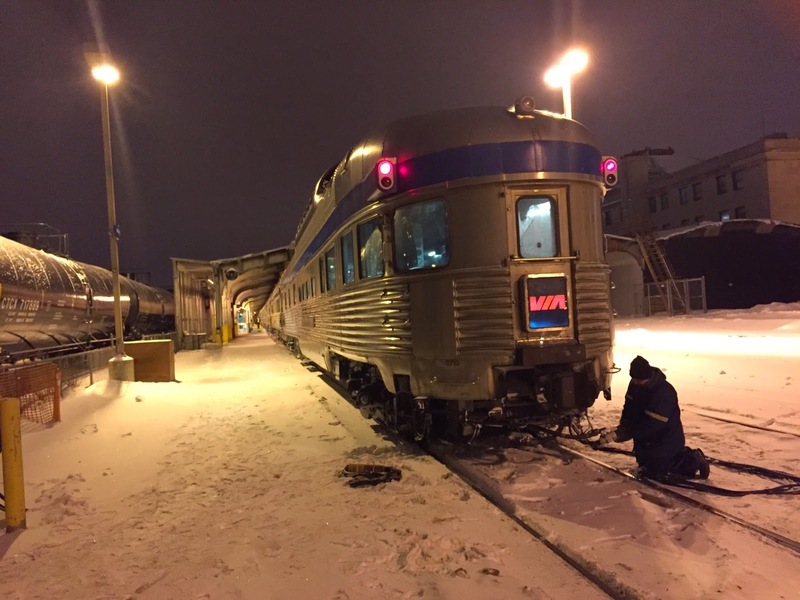 Ultimately we learned that there was no way that the line was going to be cleared in time for us to pass and as a result our train would be terminated in Winnipeg. We enjoyed a final day on the rails and ran near on time until that decision was made at which point I suppose the railroad saw no need to give us any consideration against the many freights that were on the line. We arrived in Winnipeg before midnight, but that was several hours late (partially due to them turning the train around in preparation for the run back to Vancouver prior to station arrival.) 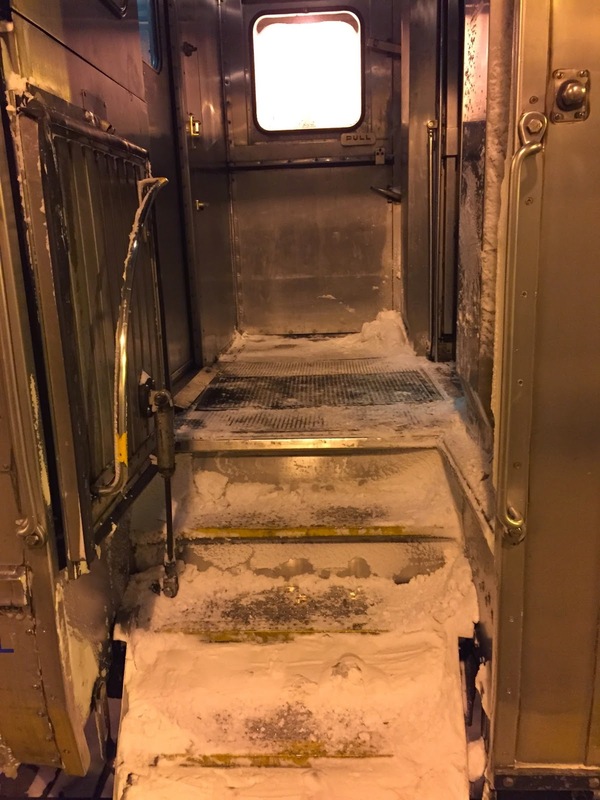 It really didn’t matter as we were all to sleep on the train before experiencing sub-zero Winnipeg the next day. Monday we awoke to find a temperature of about -4F. Via served us a hot breakfast (still excellent) and asked us to be off the train before 0900. 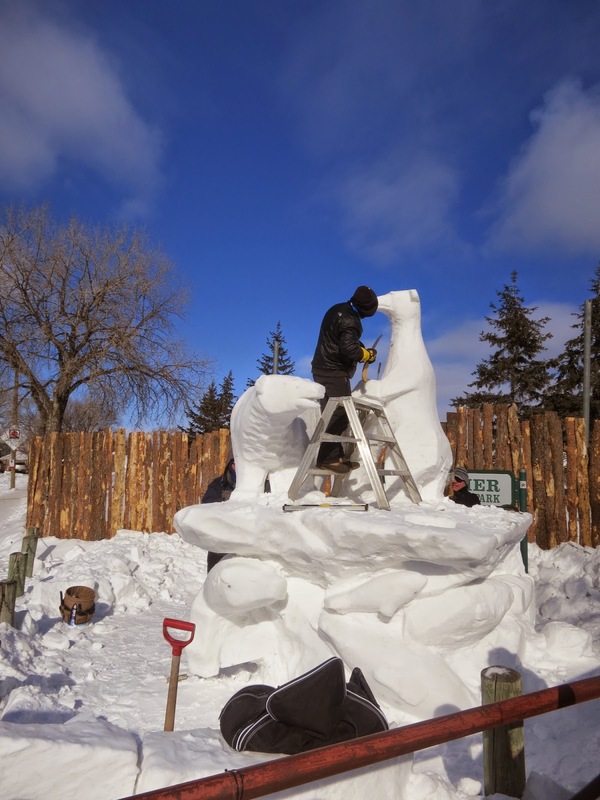 At 0930 we boarded a bus for a tour of the sites of Winnipeg (I’d been there twice before, but the snow sculptures were interesting to see.) At 1330 they took us to lunch at the Old Spaghetti Factory. At 1500 we taken to the Winnipeg airport for our 1730 departure for Toronto. This flight pulled from the gate right on time and then returned to the gate because of a mechanical problem. We ended up leaving about an hour late and got to a very cold Toronto about 2130. There a bus awaited to take us to Union Station. I had booked a room at the Hyatt Regency (because of the wonderful experience in Vancouver—but it wasn’t the same) and was in my room by about 2300. Getting to the airport was easy. I retrieved my luggage from my room at 1300, walked to the subway station, took the subway out to the Kipling station and transferred to an express bus to the airport…all for $2. Because of Global Entry and Nexus I was through customs and security by 1430. I had neglected to bring my Diners Club Card with me and so could not gain access to the private lounge so made my way to a gate that was basically a covered area on the ramp. We boarded in time to leave on schedule but then someone realized that the plane had not been swept by the US for contraband and we all had to get off. Did I mention it was cold? There seemed to be no attempt to heat the area leading to the plane. With all that we only left about fifteen minutes late and kept that to Pittsburgh where we arrived at about 1800. 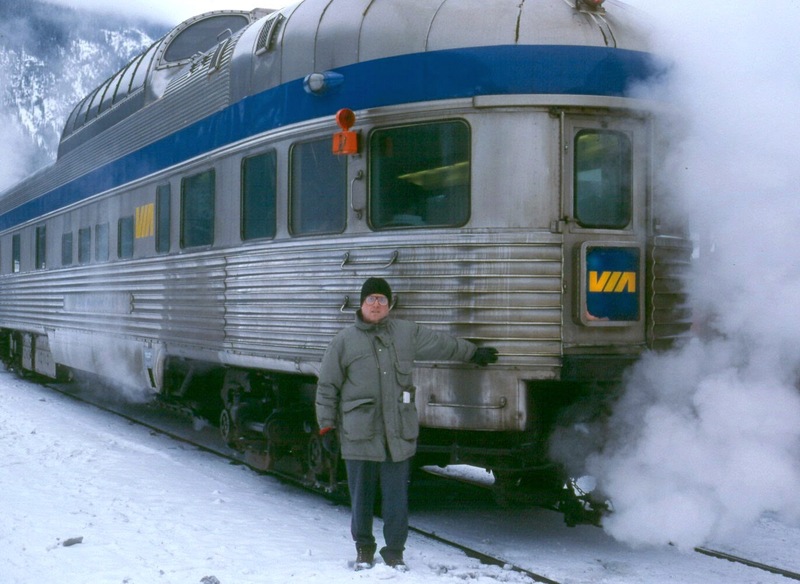 Via is supposedly refunding 25% of the fare we paid for our trip across Canada (apparently reflecting that we missed one of four nights on the train.) This is in lieu of them paying for our hotel rooms and other expenses in Toronto. They are also supposedly giving us a late train credit which can be used against another trip within a year. So it looks like I’ll be going back to Canada soon.